I really did myself a favor! Purchased this just in time. Wear it instead of a sweater. Easy on & off. Many compliments. Everyone asks where I bought it. They say price is really good. I like this shawl, I wear it around the house when I get chilly. It is comfortable, soft and really warm. 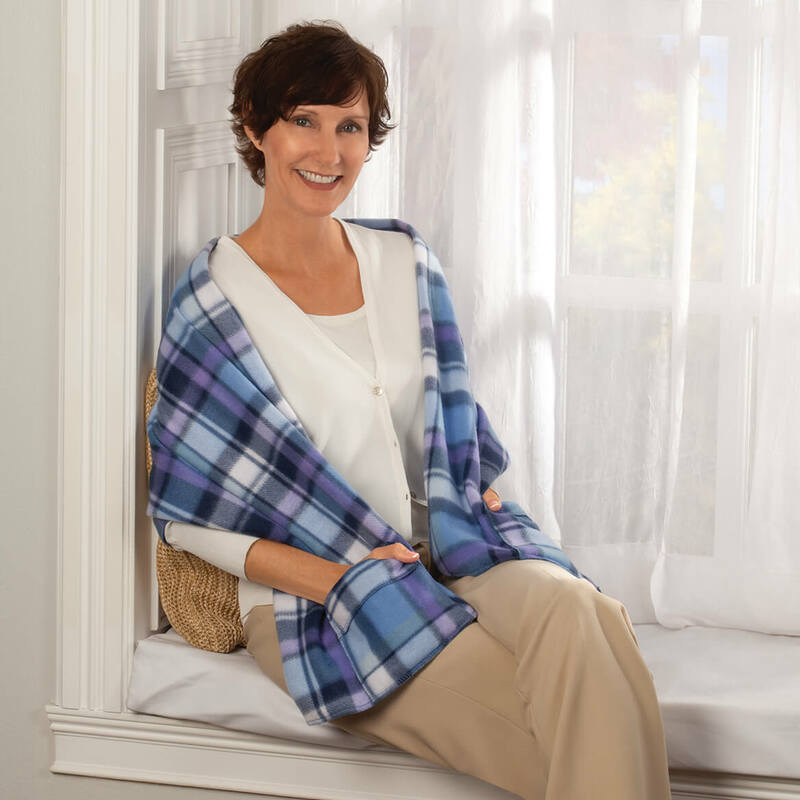 I am hot-natured so I don't need a lot to keep me warm.This shawl is really lightweight and just right for me. I bought extras for Christmas gifts for friends also. 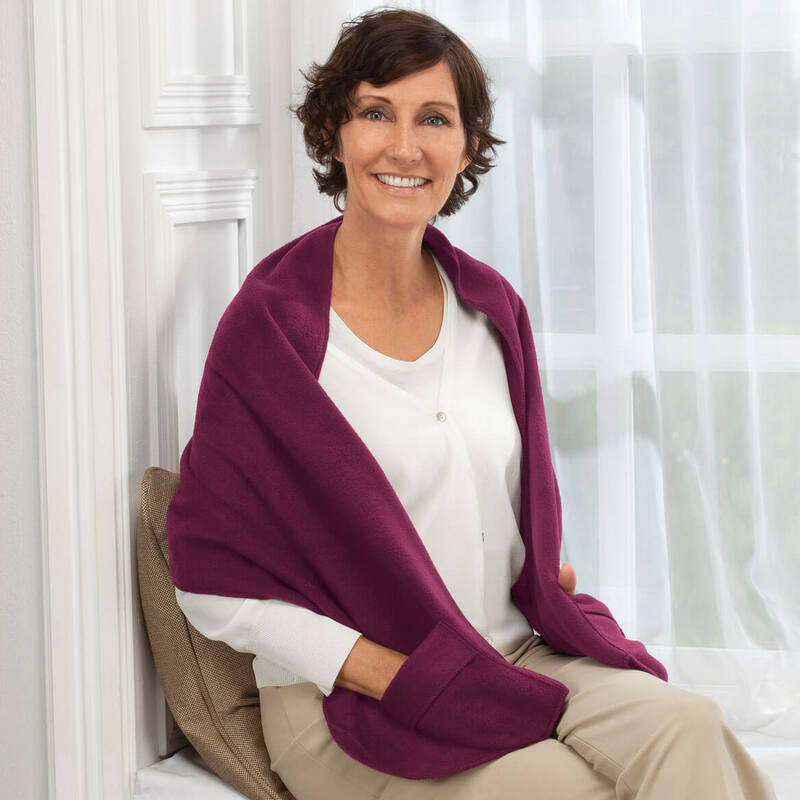 This shawl is so very warm,and cozy.When you need something extra to keep off the chill air,this shawl is just what is needed.The hand pockets are great to warm your hands.For someone who demands to be comfortable this shawl fits my every need! Just the right thing to banish a chill! I gave this as a gift to my Mother-In-Law who is in a nursing home. It is just the perfect thing for the times she is out of bed & just needs a little something around her shoulders to keep from getting chilled. It is so light weight, but amazingly warm & she uses the pockets all the time because she says her hands are always freezing. She also says she likes to fold it across the bottom of her bed to help keep her feet warm at night. This gift was a hit...I'm glad I bought it for her. I bought this for my 89 year old mother.. She just loves the softness as well as the 2 handy pockets. Needed something just around shoulders while doing needlework, reading or just watching TV. This seemed just right when I tried on. It was great to wrap around my shoulders, put my hands in the pockets and lay on the couch and watch tv. Just needed to be a little longer. bought several as Christmas presents to a couple elderly neighbors. The wraps are nice but too short. Hope they won't mind! ! Would like to use it for covering when I need something quick, this is too short. I can hardly use the pockets because they come up too high. I bought this for a friend who is having back surgery. I am disappointed in the thickness of the fabric (not!) and the length (short!) of the shawl. I am only 5'1" and it feels too short on me. I guess you really do "get what you pay for." Shall too small, keeps my hands warm ! I thought it was wider than it is. I wanted something to throw over my shoulders when I went out. It's too narrow. I needed a Shawl to go around my shoulders and down my back and around my arms while wathing tv. This is not a shawl it is too small to even call it a shawl it's as big as a scarf with pockets for your hands. It's not wide enough too cover my backside it only covers my neck and the top of my shoulders. I'm not big! I'm a little old lady. I'm not happy with this Scarf/Shawl, I will be returning it. Please KEEP YOUR MONEY! It would be ok if it were longer, doesn't wrap around as well as I would like. I have one in ivory and it keeps my shoulders warm. I love the pockets. 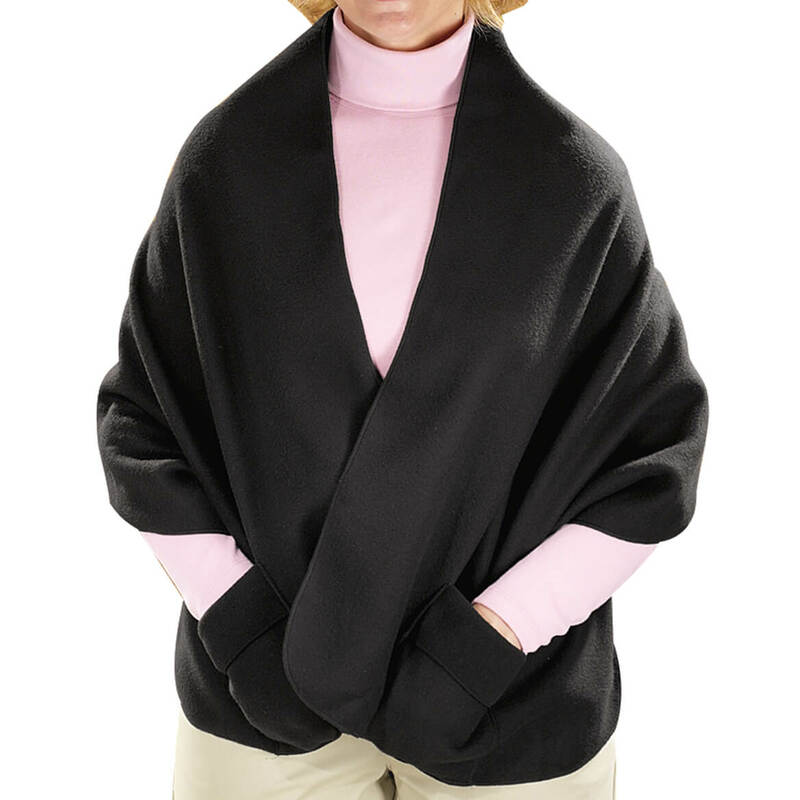 I like that it was fleece, washable, had two pockets, made in USA and came in many colors. I wanted to get them for my mom to keep her warm!! I get cold in the upper body. I work outside so l figured this would be quick and easy to grab on my out the door. Great for the girls in my life... look good and stay warm. what are the dimensions of the shawl? BEST ANSWER: Thank you for your question. The shall measures 60" x 20". We hope this information will be of help to you. is this a good fit for short people? BEST ANSWER: Thank you for your question. Yes this should work well for short people. We hope this information will be of help to you. color burgundy appears to be more plum or purple color online - is it burgundy/wine color?